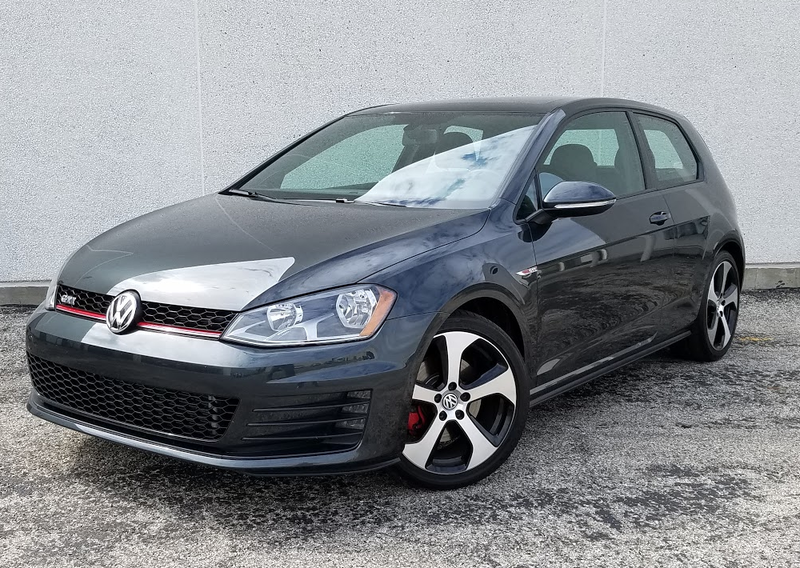 Considering that it’s already a part of the Volkswagen Golf family, it’s easy to forget that the delightfully fun-to-drive GTI is not a preprogrammed one-of-a-kind car. It’s more or less a series of its own, with a choice of two- or four-door hatchback bodies, a Performance Package upgrade, and a choice of up to three trim levels depending on the body style. 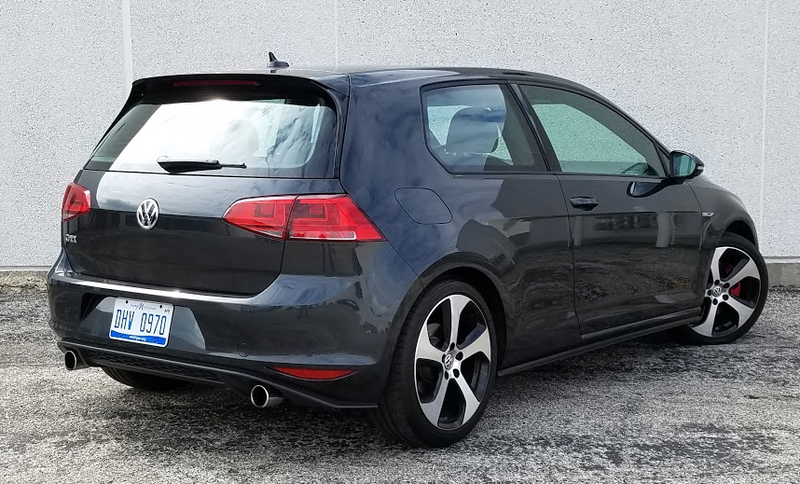 The GTI’s aggressive-looking 18-inch wheels and subtle dual exhaust tips communicate its sporty-yet-mature personality. As such, you can get a GTI plain (but not austere) or fancy. 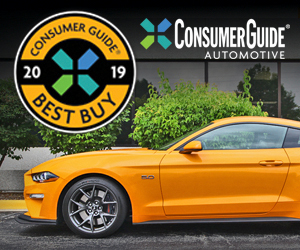 For 2016, Consumer Guide® editors got to test a cushier version of one their “Best Buy” picks in the sporty/performance class, a two-door with SE trim. All Golf models offer roomy front-row accommodations along with a reasonable amount of rear-seat space. The two-port GTI returned to the fold in 2015 after a year out of the lineup. Its body was slightly wider and longer than previous models, and the 2.0-liter turbocharged four-cylinder engine was bumped up to 210 horsepower. Nothing about that has changed for ’16 but that’s not to say the GTI was ignored while going from one year to the next. A rearview camera is now standard in all models, as is VW’s Car-Net infotainment system that integrates smartphone-enabled apps and includes Security & Service emergency-assistance links. The GTI was the original “hot hatch” when it was introduced in the U.S. back in 1983. The 2016 model continues to balance sporty fun with affordable practicality. Driving dynamics in the ’16 SE were no less entertaining than they were in the two-door S that CG sampled last year. Both cars had the base 210-horsepower engine (220 is available in the Performance Package) and six-speed manual gearbox. This reviewer’s turn in the car covered 126.1 miles and delivered 23.7 mpg, with 65 percent of his driving under city-style conditions. (In the 2015 GTI test he saw 25.6 mpg with a more even mix of city/highway driving.) Even in sluggish stop-and-go driving, there’s sufficient torque to reduce the need to shift a lot—but the cooperative clutch and pretty precise shifter won’t aggravate drivers who opt for the hands-on transmission. Responsive steering translates into nimble maneuvering. Standard selectable driving modes—“Normal,” “Sport,” and “Individual”—somewhat modify throttle and steering behavior. Body lean in cornering is controlled well. The sport suspension with 18-inch alloy wheels and summer performance tires (a no-cost alternative to standard all-season rubber) is damped well enough to keep the ride from being harsh when encountering road irregularities. Not that there’s anything wrong with the S model’s cloth upholstery, but the SE’s leather appointments do add a sophisticated air to the interior. 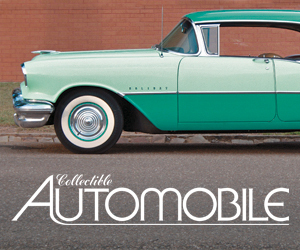 Common to both are soft surfaces with a little give atop the dash, console armrest, and doors. Red contrast stitching and bright highlights (including on the pedals) relieve what would otherwise be unrelenting black. Legible tachometer and speedometer dials are separated by a configurable vehicle-information display. The manual climate-control system is easily handled by three dials. VW’s “Composition Media” display for the easily programmed audio system features a 6.5-inch touchscreen in the dash. 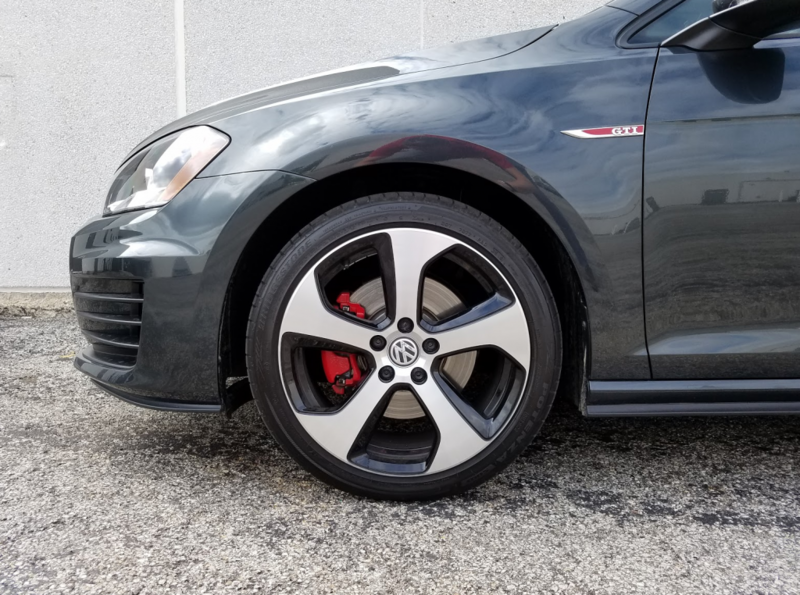 High-performance “three season” tires are a no-cost option on the GTI. Folks in the Snow Belt should consider sticking with the standard all-weather rubber. A straight, flat roofline with big windows provides both great driver vision and all-around headroom. There’s good support and ample legroom for front passengers. Long-legged riders might feel cramped in back, but this 5’-10.5” tester would fit fairly comfortably behind someone roughly his own size. Entry and exit to the rear seat are surprisingly easy for a small two-door car. Personal items can be contained in a big glove box, a small console box that cedes some space to USB and auxiliary ports, pouches on the backs of the front seats, and pockets cut into the doors and rear side panels. In an upscale touch, the pockets are lined in a fuzzy gray material. Two open cup holders in the console are provided for front passengers but rear-seat occupants can take their pick of cup holders in the pull-down center arm rest or a pair of floor-level units, one on either of the side panels. 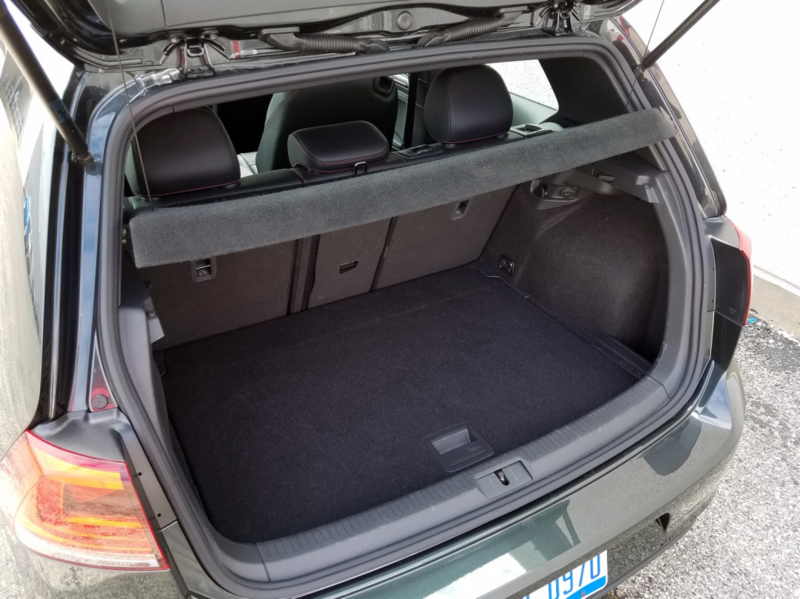 The rear cargo area loads flat at bumper height and is large enough to contain a week’s groceries or a couple travel bags. Some more fairly flat items will fit atop the spare tire under the floor, and there are small bins at the back corners of the cargo hold. Tiedown hooks and a power point are found in the compartment. For more capacity, the 60/40-split rear seats fold almost flat with a smooth transition from the load floor. A center pass-through opens to accommodate long objects. There wasn’t a single extra-cost option on CG’s test car, so the fully delivered price came to $28,845. You can spend more—notably for the Performance Package and the Driver Assistance Package with a raft of electronic safety features—but it’s nice to know that you don’t have to in order to enjoy driving fun that’s still practical. Two-door Golf GTI models cut a slightly sportier figure than their four-door kin. Written by: The Daily Drive staff on July 12, 2016.on July 28, 2016.